Tell us your pet’s age, breed and weight so we can tailor your pet’s treatment. We’ll send your pet’s flea and worming treatments direct to your door exactly when they’re due. Never forget your pet’s treatment again, when it arrives in the post it’s time to dose! We don’t tie you in to a contract so you have complete control and can cancel at anytime with ease. You only pay for what you need based on your pet’s species, age and weight. Enter your pet’s details below to see how much it will cost to protect your pet. Our vets send your pet’s flea treatment monthly and worming treatment every 3 months. Treatments are tailored to your pet and delivered direct to your door exactly when they’re due; when it arrives in the post, it’s time to dose! We’re cheaper than most vets on like for like brands and delivery is always free. Dental disease is very common in our pets; it is hard to spot, and our pets do a good job of hiding their pain and discomfort caused by it. Over time, plaque and tartar build up around their teeth, bacteria will spread and multiply, and bad breath usually follows. Eventually this will lead to dental disease, with sore gums and rotting teeth. To learn more about dental disease in dogs, click here. Or, if you’d like to learn more about dental disease in cats, click here. Being able to brush your pet’s teeth will help to ensure that they maintain good dental health, keeping them happy and healthy. What’s more, you may also save on vet bills in the long term! * Top tip: Adult toothbrushes are suitable for medium to large dogs; children’s toothbrushes are a suitable size for small dogs, and toy/miniature breeds may be best suited to a cat toothbrush! By following these gradual steps and making the experience positive for your pet, you will have a better chance of success. Be sure not to rush through the stages, and don’t be afraid to move back a step if your pet is not quite ready! Begin by getting your pet used to being touched around their face and mouth, ideally from a young age. This will make it easier for you and your vet to examine their teeth, and less stressful for your pet. Practice lifting the side of their lip, and praise them for letting you do so. Using a cat or dog toothpaste (human toothpaste can be harmful to pets! ), place a small amount on your finger and allow your pet to lick it off and get used to its taste. Gently lift the side of the lip and wipe a tiny amount onto their teeth - remember to praise or give a treat for good behaviour! Introduce the toothbrush to your pet. Start by pressing a small amount of the pet toothpaste into the bristles of the toothbrush. Gently lift the side of your pet’s lip as before, and gently brush the teeth at the side of the mouth. Doing this for a couple of seconds is plenty to begin with. Gradually build up the length of time as your pet gets more used to it, and begin brushing the back and front teeth. You may find a small toothbrush easier to reach the back teeth. Brushing your pet’s teeth is the most effective way of maintaining good dental health. However, if you have had no success and your pet will absolutely not tolerate it, there are other alternatives to help manage their dental health. Feeding dry food, particularly a diet formulated to help dental health, will help to scrape plaque from the tooth surface. Consult your vet before switching your pet’s diet to make sure it is suitable for them. Chews and toys designed for dental health also act by scraping off plaque. Just be careful not to overfeed on the chews or your pet may become overweight! Dental hygiene powders and gels can be added to your cat or dog’s food are also designed to help reduce bad breath, tartar, and plaque. Ask your local vet or vet nurse which product they would recommend. Lastly, your vet may recommend a full scale and polish for your pet. This is carried out whilst your pet is under a general anaesthetic. This is the best way to assess your pet’s dental health and rectify any problems such as rotting or broken teeth, and can give you a fresh start to maintain their polished teeth. 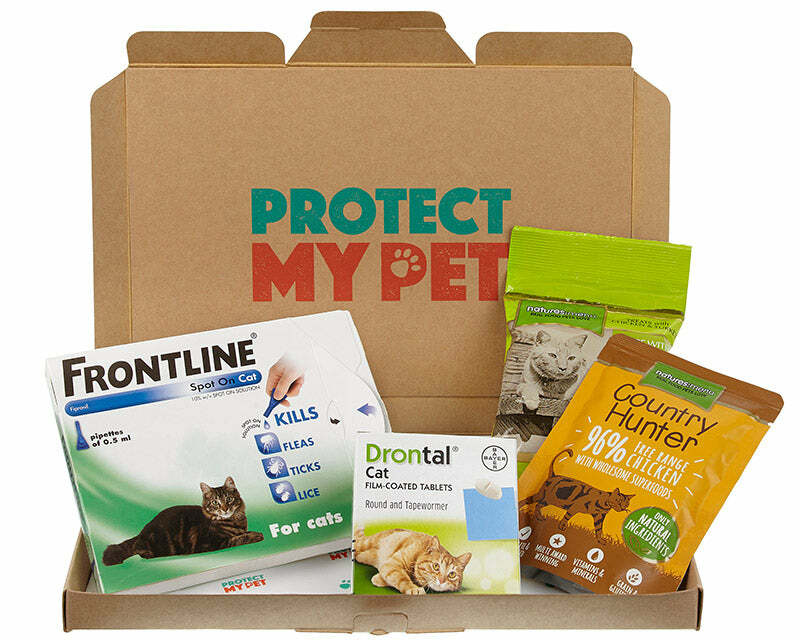 Protect My Pet pack members can look forward to a complimentary toothpaste sample in their next health box. Happy brushing! We all love to pamper our cats. Accessorising our feline friends with a beautiful cat collar can be a lot of fun, particularly as there is so much choice available. However, before you decide whether a collar is right for your cat, or which collar you should choose, it is worth considering the benefits and risks. Unlike dogs, there is no legal requirement for cats to wear a collar with their owner's identification. Microchips are the best way to have your cat carry identifying information. Collars are never a substitute for an identification microchip. If you choose to place a collar on your cat always ensure it is a safety collar that will release if your cat were to become entangled. A 'snap closed' mechanism that comes apart and releases under pressure is best. When selecting a collar try pulling the safety catch apart to ensure there is an appropriate fast release. Collars can get snagged on fences or branches when your cat is adventuring. Safety breakaway collars are designed to prevent your cat from getting trapped or strangulated if this were to happen. Be prepared to lose a few collars if your cat likes to explore, but this is better than the potential hazards. Never buy a collar with an elastic insert. Elastic has been used in the past to allow cats to escape should their collar get caught. However, vets have seen horrible injuries caused by cats getting a front leg trapped under these collars. Cats have been trapped like this for weeks, and it can cause deep lacerations to the armpit (axilla) region. A correctly fitting collar should allow two fingers to slide between the cat's neck and the collar. Too tight and a collar can cause pain, hair loss and damage to the neck. Too loose and a front leg could potentially become trapped. Check the fit of your cat's collar regularly, particularly in growing kittens. Wearing a collar does have benefits. A collar signals ownership, a cat with a collar is perhaps less likely to be 'adopted' by a kindly neighbour. Collars can also be helpful to convey messages, a cat on a special veterinary diet may wear a collar asking neighbours 'please don't feed me'. This message worked well on one particularly charming Burmese patient of mine, Bob. Bob had a food allergy and his owner was being very careful to only feed an expensive hypoallergenic diet, then unknown to her he would leap over the fence and feast on a range treats next door. Soon after the collar message Bob's symptoms disappeared and a rather sheepish neighbour came round to apologise. If your cat is an avid hunter, a collar bell can almost half the number of birds they catch, according to research performed by the RSPB. Bells also reduced the numbers of voles and mice brought home, which is welcome news to cat owners as well as the rodent community. Finally, dawn and dusk are the most likely times for a cat to be involved in a road traffic accident. A collar with a reflective stripe can improve your cat's visibility to motorists and potentially avoid a collision. At Protect My Pet we are committed to keeping pets happy and healthy. If you do choose for your cat to wear a collar, just remember the two most important points, that they have a good-quality safety release and that the collar is correctly fitted and frequently checked.